The Red-breasted Geese finally arrived in their wintering grounds along the western Black Sea coast. 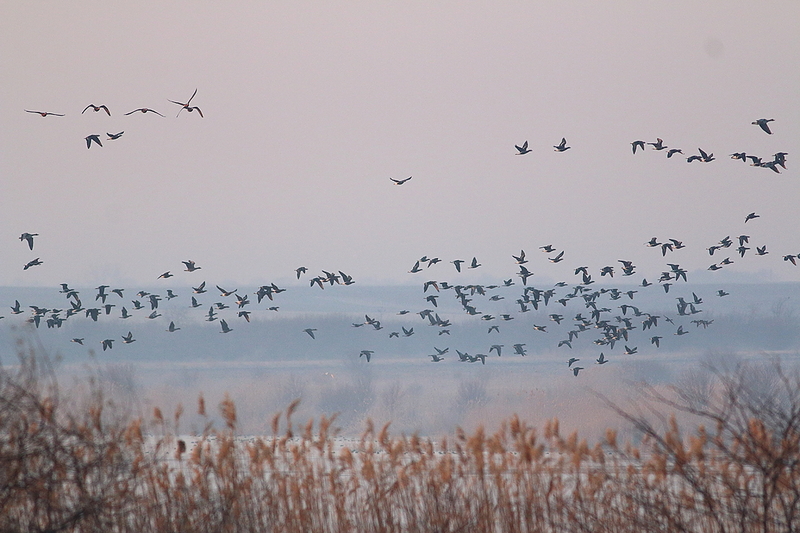 Yesterday morning we had 335 Red-breasted Geese roosting in Durankulak Lake in Bulgaria and later in the day – about 2000 RBG in Romanian Dobrogea. The Red-breasted Goose (Branta ruficollis) is the smallest wild goose and in the same time the most endangered due to its low numbers and the adverse impact of a number of factors. The birds breed in small groups on the Taimyr, Gida and Yamal Peninsulas in Russia. They begin their autumn migration in early September and the end of the month the birds have already reached Kazakhstan. Some of them continue south to the Aral Sea, but most of them are heading west, and 80-90% of the population concentrates in the wetlands on the north-western coast of the Black Sea, and more specifically in the region of coastal Dobrogea in Bulgaria and Romania. The unusual delay with which the Red-breasted Geese reached their traditional winter roosts this year is probably due to the milder winter conditions and the lack of snow, which allowed good grazing for the birds further north-east, in Ukraine and Russia. The weather till the end of January will remain unstable, with alternating warm periods and cold spells from the north, so we expect bigger numbers of geese to arrive and in the next couple of weeks and to stay in their wintering grounds in north-eastern Bulgaria and Romania at least until the end of February. For updates on the situation follow our Facebook page or subscribe to our newsletter by sending your e-mail address here. « Neophron Tours featured with InfoHub.com + GIVEAWAY!